Using a Champagne saber is one of the most theatrical and amazing ways to serve wine. It is also one of the most dangerous and little known! Sabering a Champagne or other sparkling wine bottle, known as sabrage in France, is a custom which probably dates back to the time of Napoleon. In brief, you use a sword, or other similar heavy object to knock off the end of a Champagne bottle in one clean piece, cork, glass and all. 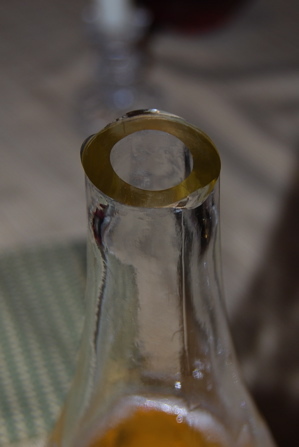 The end of the bottle, with the flanged lip with the cork intact splits off from the rest of the bottle in a clean break. The pressure inside the bottle pushes out any pieces of glass so that you are left with the open bottle to pour and enjoy. 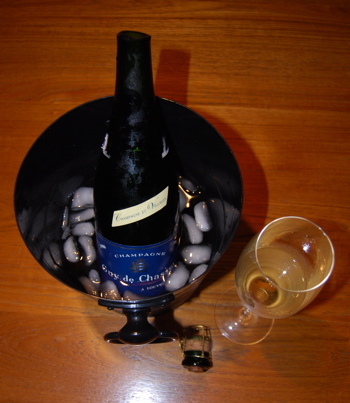 It is a dramatic and impressive way to open a bottle of sparkling wine. However, done wrong, the bottle can explode and cut you. Additionally, even if successful, the bottle tip and cork can fly off at high speed and break something or hurt someone. Therefore, sabrage should not be taken lightly and is not advised for the inexperienced! However, it makes a great conversation piece at wine tastings or dinner parties and a real Champagne saber is a great gift for a lover of fine wines! If you are looking for information on how to open Champagne bottles the normal, safe way, be sure to visit our How to Open Champagne page! What is a Champagne saber? A Champagne saber is nowadays usually a shortish and dull-bladed sword specifically made for sabrage. There are often kept displayed in a wine lover's home mostly for show. These wine accessories are often ornamented and beautiful and make a great gift for anyone who loves wine. Most people keep a Champagne saber just as decoration and a conversation piece and rarely if ever use it. However, sabering a bottle of sparkling wine can be done with any object that can be slid along the neck of a bottle and has enough weight to knock the head off. 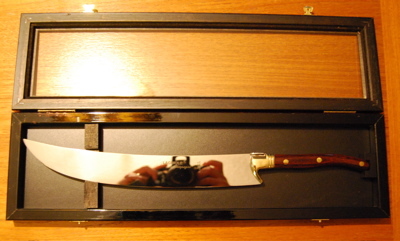 This can include using the blunt side of a large chef's knife or other similar object. We have even seen people perform sabrage with the base of a wine glass! Most people assume that sabering a Champagne bottle means that you are cutting the top or cork off with a sword. In fact, the Champagne saber is just used to smack the base of the flange or annulus on the top of the bottle. By hitting this spot where the seam of the bottle meets the head of the bottle, you are fracturing the top off the bottle by breaking it at its weakest point. The reason this works in sparkling wines is that the pressure in the bottle, which can be quite high, actually does much of the work for you. The smack from the sword or other heavy object at the weak point allows the pressure inside to do the work of pushing the top off the bottle. So in reality, the Champagne saber is not really cutting anything! Where does the art of sabrage come from? There is some disagreement about the origins of sabrage but the most common legend is that Napoleon's cavalrymen were handed bottles of Champagne. While riding on horses they were unable to easily remove the foil, wire cage and cork of the bottles. Therefore, they simply pulled out their sabers and knocked the top off of the bottle with one well-placed blow. How do you use a Champagne saber? *First of all, we must say that no one should try this without proper instruction and supervision by a professional who has experience with sabrage. Besides potentially shattering a good bottle of Champagne, there is the risk of broken glass cutting you or someone nearby. Additionally, the top of the bottle flies off with great speed so it can injury someone or something. Do not try this at home! Firstly, sabering a bottle should only be done on sparkling wines with hearty, good quality bottles. Cheap, thinner glass or non-sparkling wine bottles will shatter. Also, only use well chilled bottles. If not fully chilled they will shoot lots of wine out and you'll loose half the bottle! If you don't wear glasses, put on eye protection. Remove the foil capsule on the bottle completely. Unscrew the wire cage over the cork and bottle head. Lift it slightly and then tighten it back down over the second lip, just under the cork (the first bump under the top of the bottle). This leaves the lower, larger ring (flange or annulus) free. You can remove the cage completely but this risks the cork popping out on its own! If right handed, hold the bottle by its base out from your body. Consider holding it with a kitchen town draped over the bottom part of the bottle so that if the glass does shatter it is less likely to cut you or go flying. Hold the Champagne saber, or other suitable object, with your right hand. Find the longitudinal seam that runs along the side of the bottle from base to top. If you cannot see it easily, feel along the neck of the bottle to find the seam. You will be sliding the saber up along the seam towards the top of the bottle to hit the lip at the top. With the seam facing upward, lay the saber low on the neck of the bottle and hold the bottle at at least a 30° angle from the floor (less angle will result in more wine loss). While pointing the bottle away from other people or anything that can be damaged, slide the saber up along the seam on the neck with a brisk, punch-like movement. The blunt saber or knife should hit the underside of the lower lip at the top of the bottle firmly where it meats the seam below. If you hit it correctly, the top should fly off easily. A small amount of Champagne will fly out as well but if it was well chilled and you are holding it slightly upright this should be minimized. You can now serve and enjoy! Note that the cut edge at the top of the bottle can be sharp! Do not drink straight from the bottle and be careful not to cut yourself on the edge. A chilled bottle can be slippery so hold it from its base with your finger or thumb in the punt (the indentation at the bottom of the bottle) so that it does not slide through your hand and cut you as it does so! Safety Note: Again, we emphasize the fact that using a Champagne saber or any other item to perform sabrage, knocking off the top of a sparkling wine bottle to open it, is dangerous and not recommended. It is an art that is largely for show and theater and should only be done by experienced professionals. Improper use of a Champagne saber or other object to open wine in this way can result in bodily harm or damage to property, not to mention loss of wine! Done learning about the Champagne Saber?